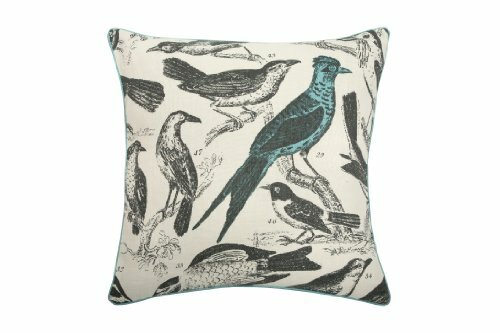 Show your love for birds by displaying decorative bird pillows around your home. Complete your home decorating by placing decorative throw pillows on sofas and chairs or create a quick and easy change of scenery by replacing your old throw pillows with new ones. Throw pillows decorated with birds is a fun and interesting substitute for pillows with traditional patterns and shapes. 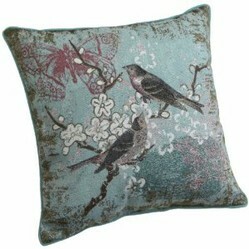 Decorative bird pillows always look beautiful and there are many styles and colors to choose from. This beautiful decorative tapestry pillow is embroidered in the finest detail and depicts two birds atop cherry blossom branches. The beautiful blue color will add a complimentary touch to any color scheme in your home. Other colors embroidered in the pillow include greys, maroon and teal. The back of the pillow is made out of a soft material similar to suede. This pillow measures 18 inches and is filled with 100% polyester. The Canadian geese are ready to migrate and add a decorative touch to your decor. 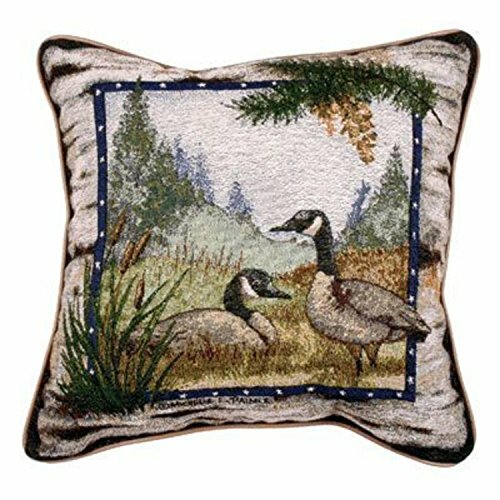 This throw pillow was designed by artist Michelle Palmer and depicts two Canadian geese in a field with cattails and trees. This pillow measures 17 inches, is filled with 100% polyester and made in the USA. 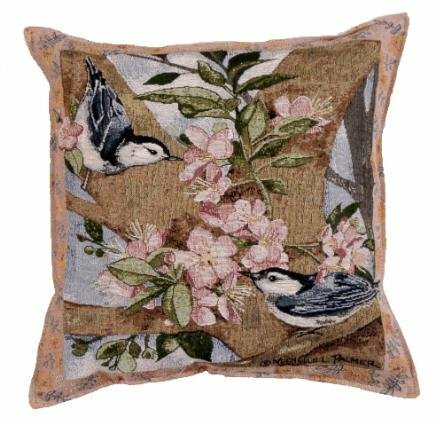 Canadian Geese Goose Bird Decorative Throw Pillow 17" x 17"
The cute little Nuthatch birds are having a ball in the pink flower blossoms. This decorative tapestry throw pillow has many subtle shades of pink, green and grey that will blend in nicely with your decor. This pillow measures 17 inches and is filled with 100% polyester. This is a Thomas Paul 100% linen throw pillow. It measures 22 inches by 22 inches. This pillow is also available in the smaller size of 12 inches by 20 inches. The feather down insert is removable through the hidden zipper. The blue bird and the blue piping on the edges of the pillow add a flash of color in the right places. I'll admit I'm not a big fan of the color orange, but I am totally in love with this pillow. 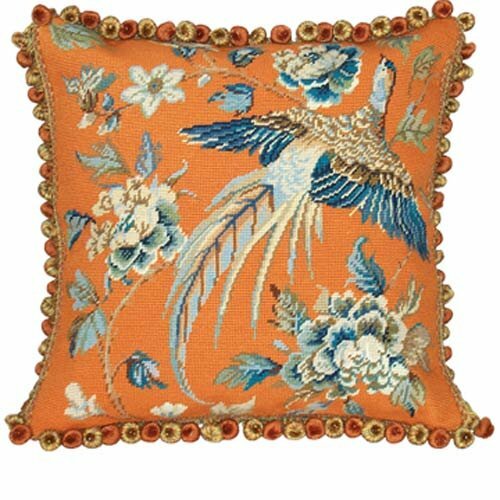 Bright, colorful and gorgeous are three words that come to mind when I see this decorative bird pillow. The hand embroidery is second to none on this 18 inch, 100% wool pillow. You will add a touch of splash to any room in your home when you display this beauty. Made in Hungary, this pillow design was inspired by a hand painted porcelain vase from the 19th century. The vase is displayed at the Hungarian Hollóháza Porcelain Museum. 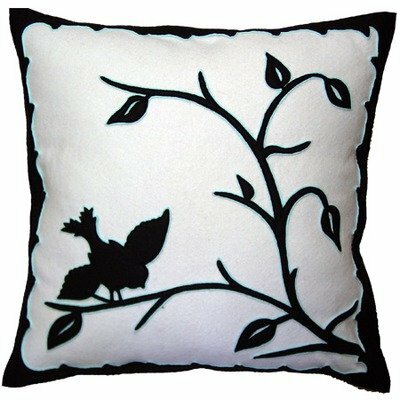 This 18 inch decorative pillow features high quality reverse black and glacier felt appliqued by hand on a white felt background. Unzip the zipper on the back of the pillow to remove the down pillow form. Thank you. I tried to include as many different styles as possible as there are many different tastes. Sea birds are a beautiful element in a nautical or coastal decor, and throw pillows are one of the easiest ways of all to incorporate their natural beauty into your own decor.